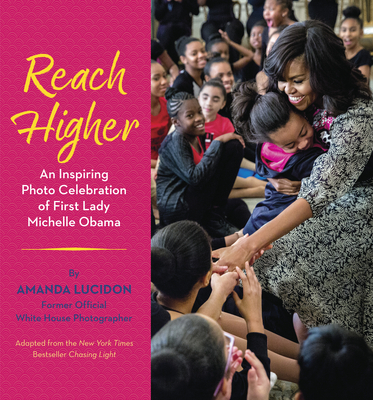 Reach Higher: An Inspiring Photo Celebration of First Lady Michelle Obama (Hardcover) | Let's Play Books! This gift book collection of photographs of Michelle Obama from an official White House photographer is perfect for young readers who want to get in on all of the excitement happening around her memoir Becoming! Amanda Lucidon served as an official White House photographer responsible for photographing First Lady Michelle Obama from 2013 to 2017. She is one of only a few female White House photographers in history and was the only woman photographer during her time in the Obama White House. She is also an award-winning documentarian, filmmaker, and former freelance New York Times photographer. Amanda's work has been honored by Pictures of the Year International, National Press Photographers Association Best of Photojournalism, and the White House News Photographers Association, among others. She is a photographer, filmmaker, author, and public speaker based in Washington, D.C.